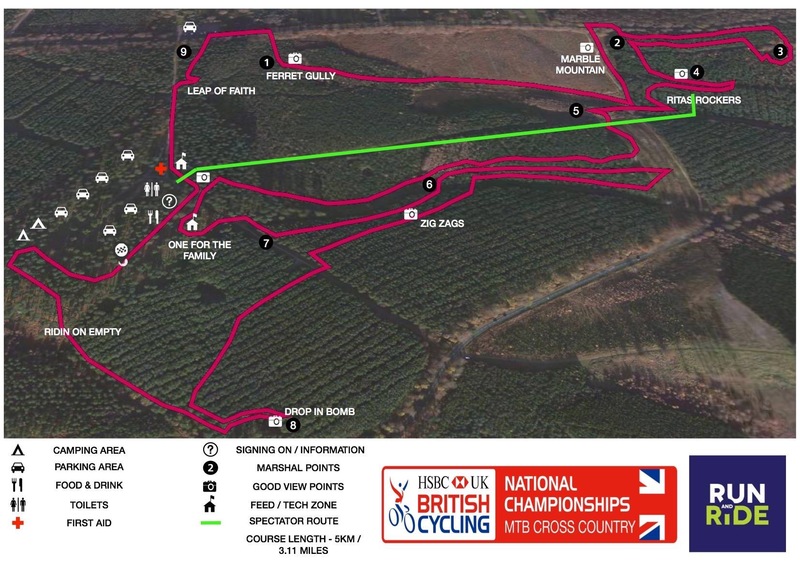 HSBC UK BRITISH CYCLING MTB XC NATIONAL CHAMPIONSHIPS 2017: – iainwebbxcmtb: The Pedalling Baron of Positivity. Saddle up and enjoy my world of Mountain biking. 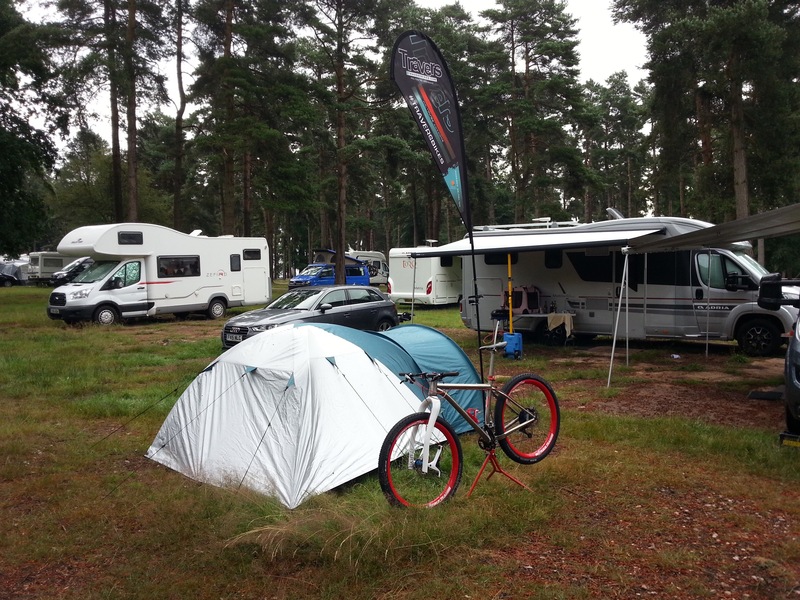 Here we go then for another thrilling weekend of camping, fun, laughter and off-course the serious stuff, MTB racing. The weekend starts as usual for me, by finishing work and going to bed for a few hours before setting off on the drive to location – this weekend that be at Cannock Chase – Tackeroo Campsite, Rugeley, Staffordshire. As I work nights, only took a few hours sleep so as to try and turn the time around to get a good kip on the Saturday night. As I’m currently starting this off at location, all good so far, with only a few spots of rain…. Ok, I spoke/wrote to soon, it’s now chucking it down and waiting for the Dales and Gibson’s to arrive with there entourage, so as to get the spacing right for vans and tent. Finally here, it’s the Gibson’s first……Catch up laters! All settled in now and camp sorted, with the rain holding off long enough for Nathan to help me put up the tent, my living accommodation for the weekend. Tent up just in time for the rain to start again and that’s the way it stayed for the rest of the night, Rain!! “Thought” – Must sort myself a van out for these events, crawling in and out of a small tent at 51, is not much fun anymore. Saturday morning – drifted in and out of sleep all night due to the constant down pour and thoughts that I was floating off on the pump up bed. Time check – 7:30, notice a small leek in the corner, no I didn’t bring any from the allotment…….. All is fine I’m not wet, just damp from my own condensation – the outer layer is touching the inner layer and the beads of rain are just waiting for me to brush up against it…… yeah right, I’ve done yoga!! 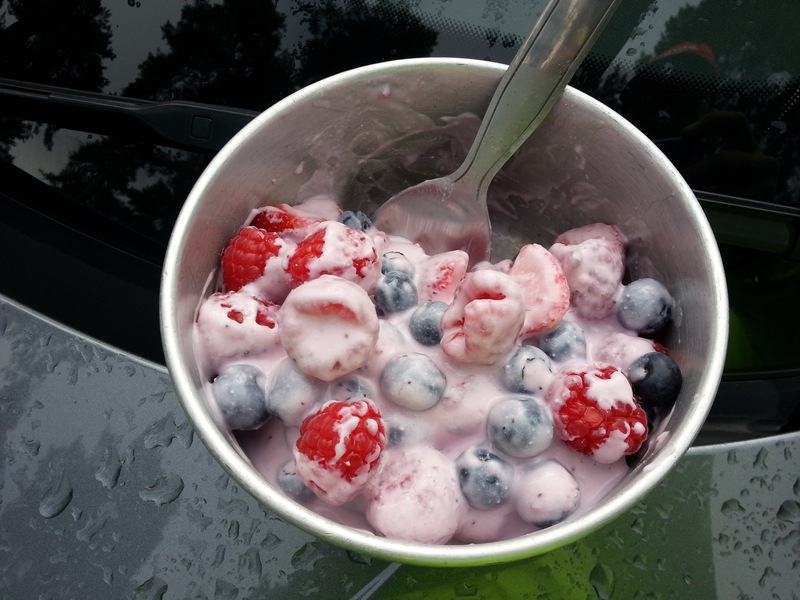 Breakfast time – nice bowl of fruit (minus the bananas, still at home in the fridge, blip…) and yogurt, followed by portage and washed down with a coffee. Sometimes the simple things in life bring a smile to the face. Rain finally gave in with only the odd spot or two here and there. Mick Curtis and daughter, Sapphire arrived around about 8am, for a chat and coffee before it was time to sign in, pick up number boards and timing chips then walk the course at around 10am. 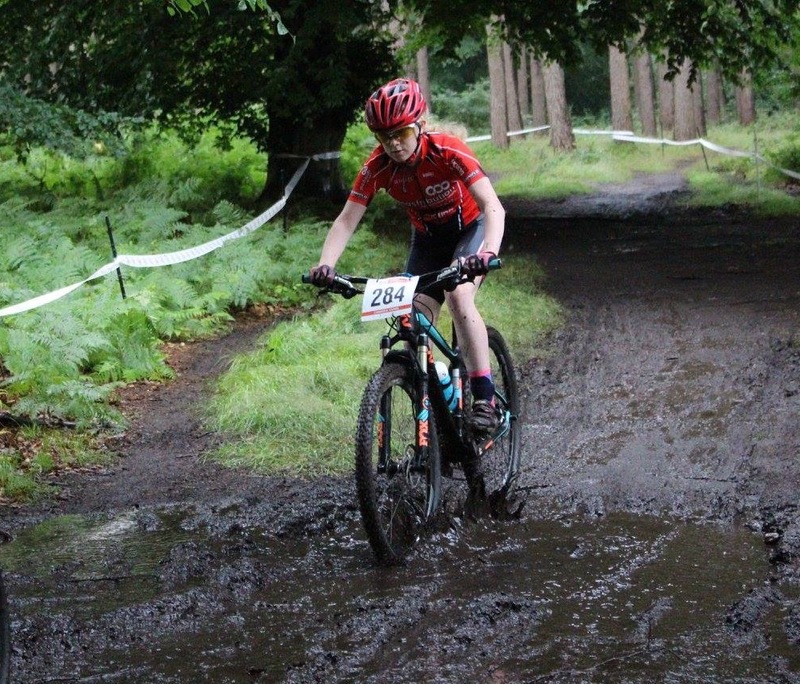 The course was great, flowing, with enough places to overtake, technical features and enough elevation to burn most legs, puddles, small amount of mud (soon to change with two nights of full on rain and 400+ riders over the next two days). Walk through done, it was time to change into Travers kit (Practice day attire) and have a ride of the course. All hills done, both up and down, still on the bike, no falls, no A Line attempts, only B lines!! That felt great and was encouraged to go out again later after a nice light lunch. Light lunch done, thought I’d have a look at others attempting some of the A Line features, to watch and learn, watch and learn!! Opted to watch the first drop off and the rock garden and they made interesting viewing. I attempted the first drop off after an excellent demonstration from John Newport, only to slide out at the bottom and resting nicely up against a bush to the right. As for the rock garden, we’ll forget it, as I look at them, they seem to be calling at me – “come to me Baron, come to me”. Yeah right, “go do one, you don’t fool me”…. Afternoon races finished and the course was open again for practice. This time I went around with the youths, Nathan, Alex and Sapphire. Nathan showing Sapphire and myself how to do the various A lines several times to which I did attempt the second A Line drop off. First two times I did the drop, missed the right corner and finally getting it right at the third attempt. Again as for the rock garden we watched Nathan skilfully negotiate, several times but, did not attempt. “Your not going in the van looking like that my lad”. Nathan Gibson wash down by Paul Gibson. Race day Sunday fast approached and I didn’t sleep well again which seems to be the norm before a race. I guess this is in part to the noise of the rain, my unusual sleep pattern (due to night working) and anxiety for the race. Oh well, here we go again, not great but one will do ones best. I watched the start of the youths races and the first lap, cheering on Alex, Nathan and Sapphire before getting changed and warming up for my race the Grand Vets. Looks like the course was churning up nicely with mud by the looks of youths. The call for grinding starting at 10:30 for a 10:45 start and I was in the back row gridded number 37 out of 40 in the Grand Vets Category. Managing the HR, keeping it down (125bpm) whilst focused…….Bang, off we go and managing to hold my own whilst trying not to over cook it. 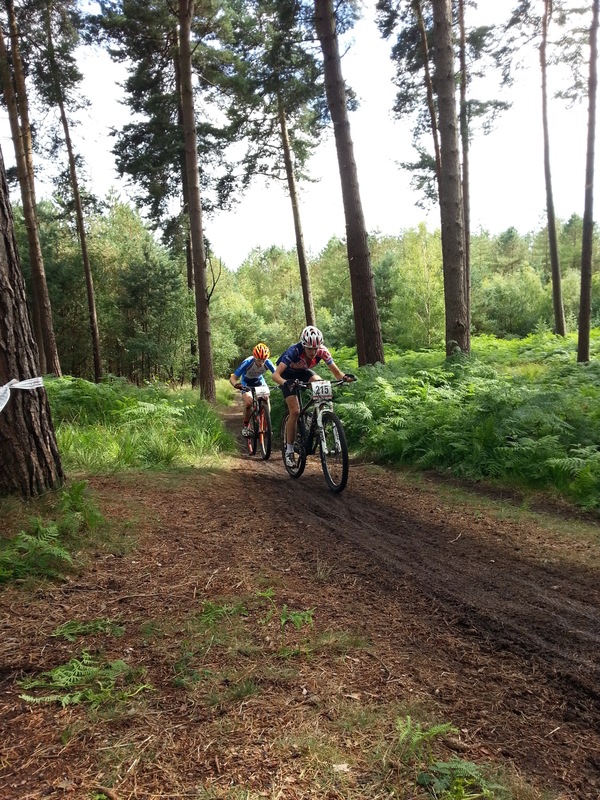 Into the first left hand corner, touching bars and squeezing through, down to the next, this time right hand corner and into single track, roots, mud annnnnnnd, stand still, come to a stop whilst those mid way through bunny hop a log and into more mud. I took the safe option and B Lined it, only losing a couple of seconds each time, better then losing some chain ring teeth, which from the look of the log, had been done a few times. Sapphire Curtis just before first A Line drop off. Onwards and through more mud up to the second A Line (drop off) and B line option again. I was followed by a few others as someone had just come off on the drop off, thus good call!! 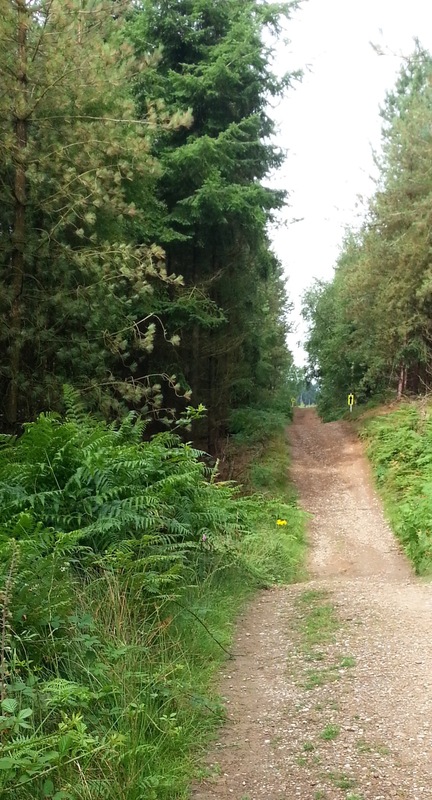 Out of the woods and single track to a wide track down hill, power on and slide all over the but, keep control, left hand sharp corner into mud and the start of a 100 metre pebbled up hill section, just enough to get the HR raised and out of breath…and…. Back into a wooded section of single track with plenty to keep you on your toes, leading into right hand down hill section into the second drop off A Line, (B line used) and more woods, single track covered in roots and the odd mud pool, riding left down and finally up into a left and onto a fire road and the camels back. Take a drink…..and…..
Camels back led into a left sharp bend into the woods and down to the rock garden or the B Line with five switchbacks down through the trees, half on/off the bike, one foot un-clipped for quick bail out. Up the next muddy incline, off the bike and running/slipping, jumping back on in the half on/off mode of travel. Back down through the trees for more sludge and this time the sticky stuff. Off the bike again, push on up a few more meters before jumping back on and up another fire road of lose pebbles, oh yeah and breath!! Take a drink (sip). “Breath for goodness sake, get that HR down”. Must say the training/coaching from Ben Thomas is clearly working – I’m not whizzing or sounding like I smoke 40 a day….and…. From the top of this incline and fairly dry section, we move through a few small berms leading into another wooded area with plenty of opportunities to overtake. Out of this wood and right onto another wide track assent flowing back into the woods with a steeper climb heading back into the arena area and the first food/tech zone. Take a drink, no new bottle required…..and…. After the food/tech zone it was left and left again in a horse shoe effect, through mud, over roots into a small drop, over a fire road and back into the woods for a great fast down hill flowing, berms and a jump if you so inclined to style it up a little, section….. A Phillip Pearce special, me thinks!! Out of the woods, right onto fire road for a few meters, then left back into another wooded section of single track, full of roots, dips, holes and slalom effect around the trees, then a right small drop and left back onto fire road (sip) down to the bottom and a sharp right into mud and muddy incline up through the next wooded section of single track, over two logs, the second was off bike and carry over due to the angled approach needed to clear it. 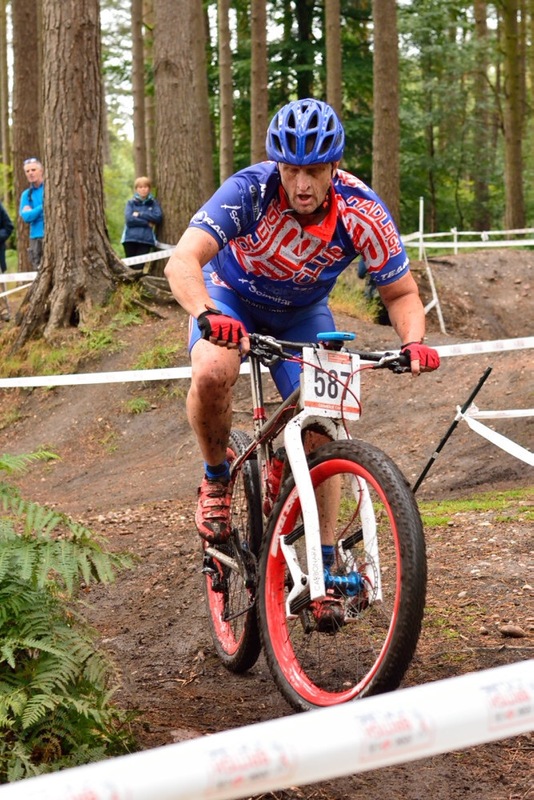 If the back wheel landed on the log, it would have been a washout…. Off course, those with good skills, did jump it, just not me!! Another 150 meters and right, out of the woods onto fire road, takes a drink (sip)…… and….. Myself, having a little slippery time. Up to the top of this incline/assent, slight movement to the left and a section of three drops at different angles, drop into first trough, move left, up and over the peak with a couple of rocks, drop off into next trough, move left again, up and over rooted peak, flat for three meters, then sharp right switchback into drop, then left around tree, switch back right, then left over berm and right around tree to small sharp incline and back to the arena and fire road start and finish line….Gel up, feed up, drink up…….and …. “We are safe behind the trees, he’s gone now”! Lap one done and two more to go for me!! 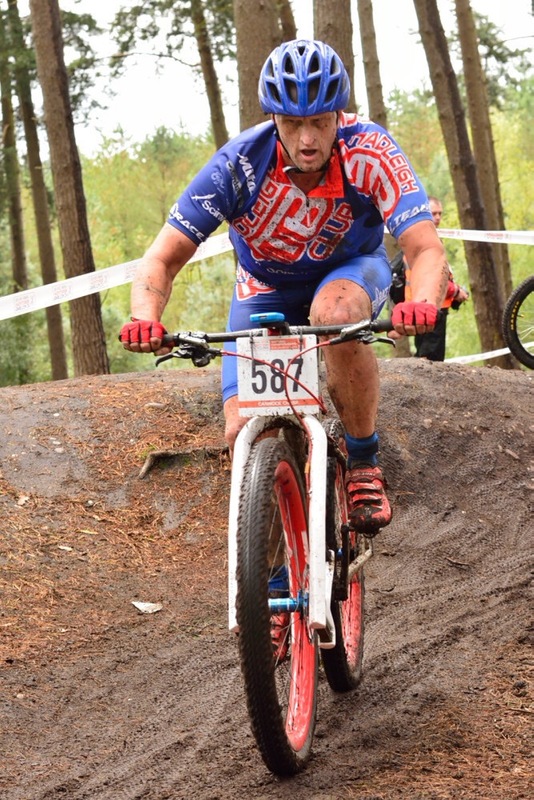 The other two laps took on the same format with the only two inclusions, 1) I steadily became slower and 2) I was having to get on and off the bike more often on the single tracks to allow the faster riders the respect and opportunity to contest for their potential National Colours. Respect and well done fellas, I have a long way to go……. Gridded at 37th and finished 34th out of 40 and no major off’s, I’m well stoked at that!! Now to wash the bike, myself, get changed, take down the tent, pack the car, have something to eat and drink, all in time to cheer on the Elite Ladies , Elite Men and Rob Staines in their respective races. Rob Staines pushing hard to maintain his position. May I take this opportunity to thank all those involved with setting up and pulling off a great weekend under testing conditions. Big up and kudos to the Marshals for keeping it safe and flowing. Thank you to John Newton and Nathan Gibson for helping me with some of the A Lines. Thanks goes to Beckey Gibson and Donna Dale for the endless supply of tea, coffee and heating up my meals and General banter…….”Whats your beef bruv, I won’t lie, your bad” well, it’s great to embarrass the respective teens……. Thanks to Paul Gibson and Charles Dale for answering my questions, general chats and borrowing various tools I lack. Thanks to the Staines (Tim, Denise and Rob) for there great company, chats and friendship…. Thanks to Michael Travers of traversbikes.com for his continued support and advice. Special thanks goes to my coach Ben Thomas, ben@mountain-trax.com for getting me to where I am now with my fitness, may we continue to move forward in the right direction!! Last but, by no means least to the continued support to HMTBC from the sponsors named below, for without you, we are just a team but, with your support we are a team with a purpose – Thank you. 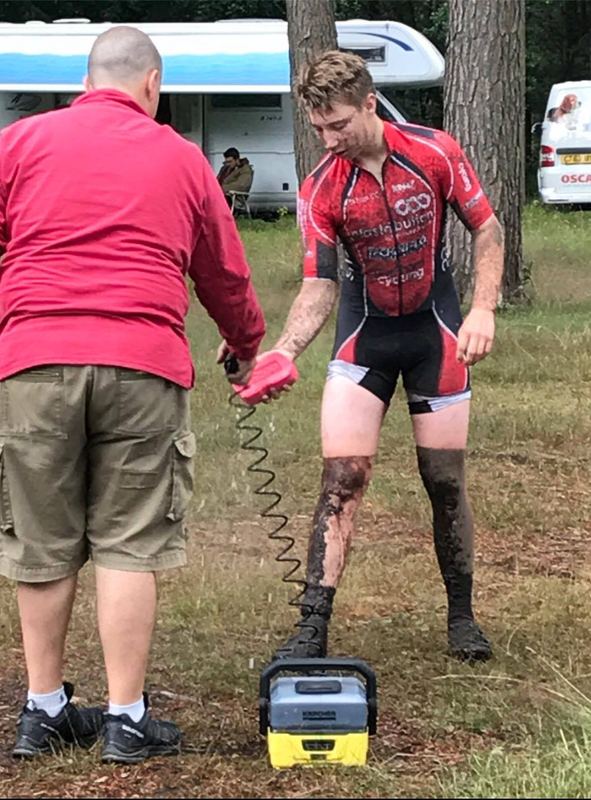 Previous Previous post: British Cycling XC MTB national championship series 2017, Round One.